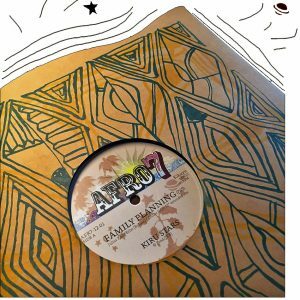 First release in th the Afro7 twelve-inch series, featuring some of the finer dance-music from 80s Kenya. Kiru Star’s ‘Family Planning’ a punchy disco groover within the benga tradion. Flip it and we have ‘Mumbi’ by the same band and another Kikuyu hit with a slight downtempo groove, bumpin’ bass and catchy refrain, check our original post on these two tracks the front page. The man behind Kiru Stars, Julius Kang’ethe (also known as Bylaw) released a string of hits in Kenya in the mid-eighties, like Mumbi, Kiharo Kia Ndege and Kaba Nditindike. Raised around the Kikuyu dominated area of Mount Kenya, south of Nairobi Julius was interested in music at early age. He recorded his first album, on vinyl, in 1981 and later on recorded 2 more albums under different recording publishers. In 1986 Bylaw began recording music under his own labels (Editions BYLAW Sounds and Coconut Records In addition to his music career, Julius is a water color and oil creative art painter. Well known Finnish Producer Didier Selin lays his touches to the original tracks with an extended edit and rework, stretching the original tracks suitable to the twelve inch single format perfect for todays dancefloors. The twelve comes in a thick silk pressed outer cover custom made in Thailand, courtest of Maft Sai of Zudrangma Records. 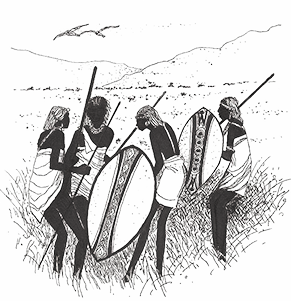 Kikuyu pattern by California multi artist Steve Roden. Release limited to 350 copies. Buy “Kiru Stars Family Planning/Mumbi” directly from AFRO7.net (good rates on international shipping! €5 to Europe, €10 to the rest of the world.) or purchase it from selected record stores worldwide. Press here to see what shops stocks this release. © AFRO7 records 2015 – All rights reserved.